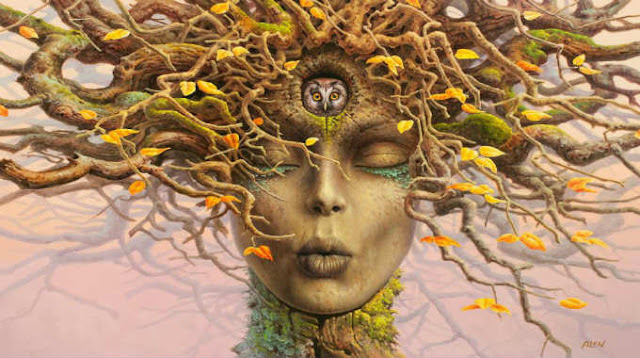 The TREES Will Teach You Telepathy… The Language of Nature! Home » Spiritual » The TREES Will Teach You Telepathy… The Language of Nature! Have you ever believed in “telepathy”? Have you ever witness something like it? Have you ever wanted to experience it? You surely can. Telepathy is a ”mind to mind” connection, without speaking, it is an immediate shape of communication of thoughts and senses. Some think it is ”language-less” – but it is not. The Empathic Telepathy is a language full of silent communication and this form is more natural to us. Maybe some of you already know that thought-forms can be transported from person to person, and even some technologies have been invented to do this. And there are spiritual beings and entities who can be telepathic with us. They can transmit thoughts or feelings. Nature communicates by sounds, aroma, colors, textures… It has both history and panoramic complexities of perception we couldn’t detect, we could not describe them, and its composition is communicated often so deeply, wonderfully. Infinite poems were written throughout the history in simple ways to write, all that you have received. Many of the readers of this kind of poems feel the beauty in them, but the writers are the ones who transmit their communication with Nature through poems, and often apologetically for an egregiously inept ability to capture in writing all that was received. The reader can’t experience what has been telepathically transmitted to the writer, only what the writer is trying to transmit it. Empathic Telepathy is more than the transference of thought. It is a high level of communication. It is a ”language” of a complication of feelings within and around the talker, which includes the entire spectrum of the communicated method. Particularly those of the Natural Kingdoms, who have many senses, and can express them. You not only get the thoughts around the communication, you get all the knowledge that happened at the moment, as well as the feelings of the talker. Usually, what has been transferred includes history. You have noticed I am using the term talker and not just ”person” as it is certainly not particular to people. Telepathy accomplishes with not only people, but with animals, and the Green Kingdoms, and Mineral and Etheric Kingdoms very successfully. It involves listening rather than hearing. Listening and hearing are two very different things. The hearing is the apprehension of the sound being spoken whose words are open to boundless explanation. You have frequently heard people say “I hear you” and yet you find yourself feeling emptiness, waiting for the corresponding answer and left unrealized. Listening include filings, rich openness and is lusciously complex and filling. Empathic Telepathy is not just ”mind to mind” communication but awareness to awareness. This requires a greater use of the brain, and a multi-sensory complexity within the body. The failure of telepathy and empathy comes from all standardized forms of ”education” and ”training”. These are processes that temper ones mind much like a steel blade is made. It is hammered and pounded, and heated, and hammered and pounded, over and over, on and on… until it becomes a blade. It has been tempered and molded by the blacksmith. And so the steely mind has been indoctrinated and inculcated into being left brain dominant, being likened more to a computing processor. It is a shape of mind control managed by well-organized institutions whose target is to make you learn what they want you to learn, most if not all of it lies, for at the very least it is incomplete. It is not education, is it fractionalized and desensitization. Those who consider themselves as clever will hear a stream of words from a speaker and frequently conceive a response before somebody finishes with speaking. It has a missile nature of being a one way arrangement. It is case like and of the intellect alone. The information pieces are chosen and placed together into intentional foundation with creative certificate. The Empathic Telepath way is to communicate frankly and fully with the truth. Empathic Telepathy listens with entire brain and body size, and is able to receive boundlessly more information, wisdom and cognition, sentient rich, in a nano second. Unlike the tempered steel mind which needs to obtain information and skills in a straight time/space continuum. Communicating with such tense mind word is totally thwarting and pointless for the Empathic Telepaths. There is a sweet taste left with the Empathic Telepathy, it is pleased, respected and well accepted, filled with much more than itself, no matter the truth. How can we become Empathic Telepaths? Who can be our teacher? Today the forms of thinking can be transmitted by a group of people and technologies, it is a one way arrangement projected into another, generally without our knowing, and these kinds of transferences are usually of the regressive kind. To recover our natural abilities we need to have a wish to be approachable, we can begin by opening and relieving our mind and making it pliable again. That is an intentional act of determination and training. After that we need to find a source of true telepaths, and the most kindly and sociable ones can be found in Nature. The trees can be our sources of communication to our friends. If you want to believe in this communication you will need to experience it for yourself. No tree will lead you off target or to lie you. They are as incapable of lying. The nature in all its forms is our relation with the veracity and the soul. You need to go in Nature and learn how to communicate. Don’t just go to talk, go to listen. This can be a practice for those who are not accustomed to receivers, but it can learn you to listen and be attentive. They will find you. You will need to spend more time in Nature especially with the trees, which are everywhere and are willing to communicate with you. You will find the Truth. You can cultivate by opening up your mind which acts as a gateway portal and is connected to them and so they will use this portal to communicate with you. Sometimes this link can happen very fast, maybe you will be surprised and you will need some time to get used to it. A type of trust is needed to grow, whatever your source is, you must trust in your mind to become bland and spirited with openness. It will be different for everyone. But the world of Empathic Telepaths is coming to us, coming to speak. This is only the beginning of restitution our connection to the Source, to our Divinity, our true Nature, and to feel as home this planet we were born on. We must communicate with our close ones and love them. It is called harmony. When all shapes of communication are open and the natural feelings and senses spread through our beingness, this is where we sense our Family and Love.